State communication records in Baroda Archive states that HH Gaekwar of Baroda was also interested in establishing air communication to and through Baroda and proposals were made to M/s Tata Sons Limited in 1937. Baroda - Ahmedabad, Baroda - Indore, Baroda- Kathiawar routes were proposed by M/s Tata Sons Ltd. Indian National Airways Limited had also proposed air service between Bombay-Baroda-Udaipur-Jodhpur-Bikaner and Lahore. It seems that proposals were not finalised. Later on from 14th November 1939 Air Services of India Limited started air service between Baroda and Amreli via Bhavnagar. Thus Baroda was connected by air with Bombay via Bhavnagar. 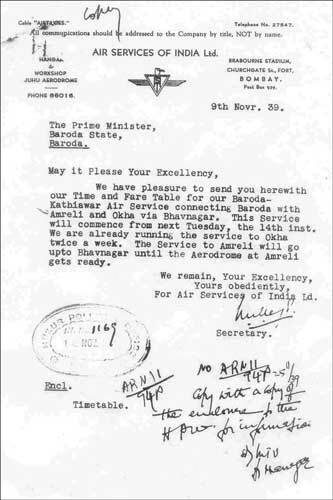 The letter mentioning the commencement of Air Service from Baroda and Amreli.